Card courtesy of Mark Donahue. 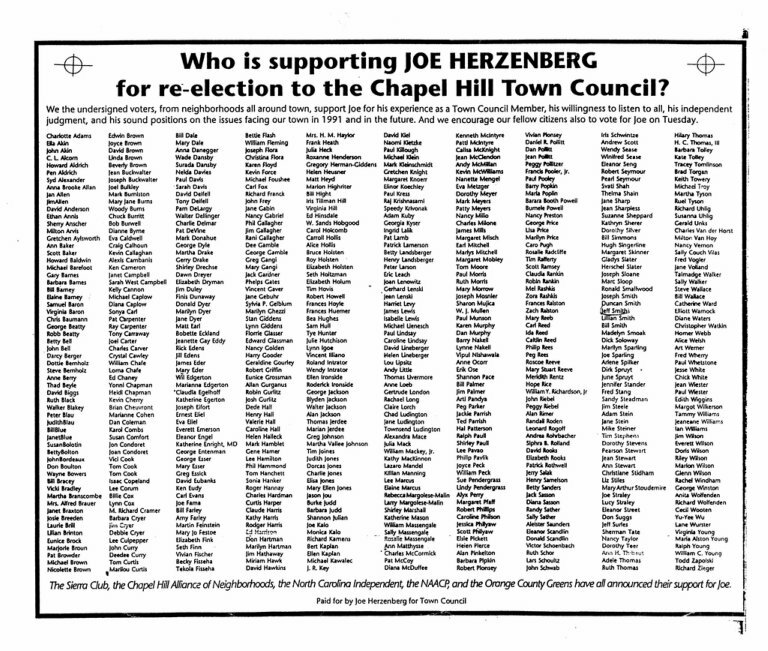 Joe sent this card to his friend and campaign worker Mark Donahue at the end of May, 1993, four months before he resigned from the Chapel Hill Town Council on September 23, 1993. A poll conducted by the UNC School of Journalism in late February had found Chapel Hill residents were divided over whether Joe should be recalled from office for his conviction the year before for failing to pay state taxes. According to the results, "thirty-one percent said he should be thrown out of office, 26 percent said he should not, and the rest offered no opinion." This weekend, hundreds of area students will hear their graduation speakers offer them words to live by. Question is, will they remember them? Probably not, if the memories of some prominent Triangle residents are representative. Graduation keynoters come, speak and rarely conquer the imagination of their newly free audience. But graduation day itself is something few forget. J. Barlow Herget got his degree and his draft notice within a few hours of each other. 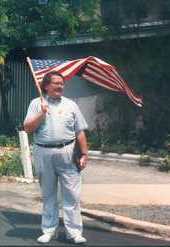 Howard Lee left home forever. 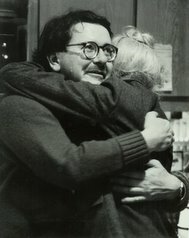 Joe Herzenberg was happy just to be alive. He was recovering from a kidney transplant. Here are their stories and those of others we asked to look back at the day they turned the page on adulthood. 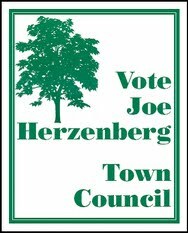 Herzenberg graduated from Yale University in 1963. "Yale had a tradition of not having graduation speakers, but President John F. Kennedy spoke in 1962," says Herzenberg, who graduated a year after Kennedy delivered an attack on the steel industry in a speech at Yale. "It was his effort to get big business to cooperate with government; you should not have an adversary relationship with government." Herzenberg majored in European history but almost didn't make it through his senior year. "I almost died. Just about eight weeks before graduation, I had one of my kidneys removed. I was so happy to be alive, I didn't mind there was no speaker."